In fact, the number of owners of motor boats is rapidly increasing, and before each problem: where to store the boat? Write on the river is not always possible, and carry it every time on the truck or the car home and back uncomfortable, hard and very troublesome. 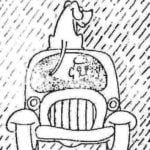 Whether the case, brought the boat on their own out of the water and happily drove her home. Snowmobile with a motorcycle engine turned out well and was surprisingly throughout the County. He builds the original design of the accordion that is so like the soloist of a large ensemble that the town of Kalinin, Nikolai Mikhailovich Purtova is already a reality. Locksmith Kalinin electrical equipment plant, noble innovator and inventor, medalist of the USSR, Nikolai Mikhailovich in many respects akin to the legendary Russian Lefty, who shod a flea. And what a coincidence, Nikolai Mikhailovich, a large master and a skilled craftsman, do left-handed. In conversation our inventor that a few months persevered the designer to give him the tool. As a musician, a bad instrument will not take! Today, the range of creativity of Nikolay Mikhailovich is so great that it is difficult to list them all. Hundreds of innovations of the N. M. Purtova embedded in the mother plant, including a major. It took, for example, a powerful press for the manufacture of granules of the molding powder such back then the industry was not released. Nikolai Mikhailovich has developed and manufactured to the original press. And toroidal winding machine for the manufacture of transformers difficult difficult to answer, since when he became engaged in technical creativity. “It was in childhood…” — says Nikolay. He was fond of making different technical crafts, disassembling and repairing locks. And in 17 years, living and working in a remote Siberian area, once at the request of a policeman removed a complex malfunction of the revolver, and had the reputation in those days, the repair of weapons for the police all around. As time went on, improved skills and expanded interests of the craftsman. An avid hunter and Fisher, Nikolai Mikhailovich somehow conceived of this machine the Committee for inventions issued to Nicholas Mikhailovich’s certificate, at the exhibition in Moscow, he was awarded a silver medal VDNH USSR. Currently, Nikolai Mikhailovich retired, but all the time in creativity. He had a permanent pass for a native plant. An avid angler, berry and mushroom, he once saw in a magazine a picture of the boat-handmade on three wheels with an outboard motor and lit up a new idea. Three years of hard work. What came out of it, you can see in these photographs: his amphibian eloquently speaks for itself. 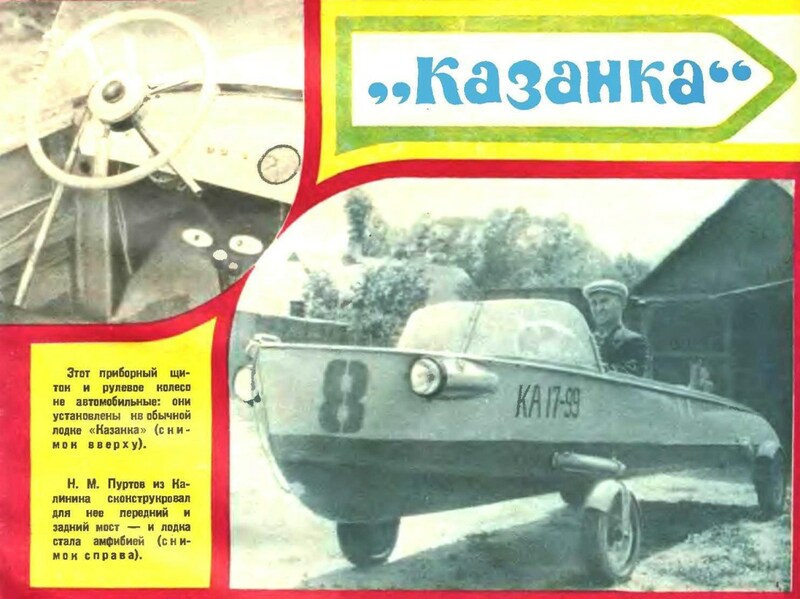 The amphibious vehicle is made on the basis of serial dural boats “Kazanka”, which is N. M. Purtov set front axle to the original design with two wheels and steering; rear axle with a differential and two wheels; the motor “M-72” reducer special design; mechanism of the propeller with remote control; fan for air cooling of the engine, with winch rope for self-recovery winch the boat out of the water. FRONT AXLE. 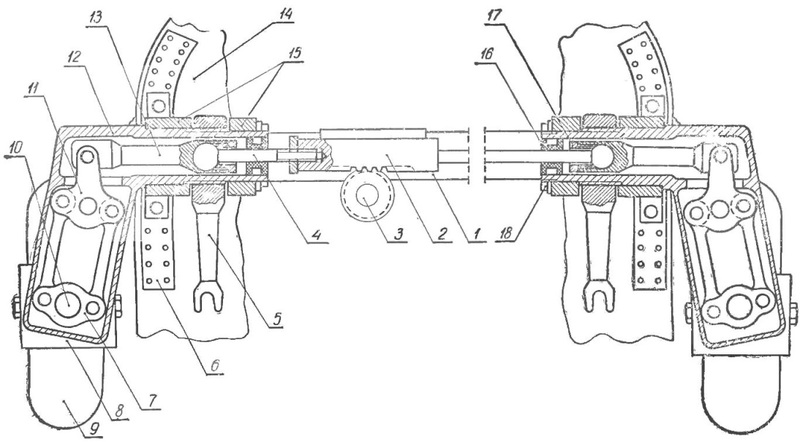 Figure 1 in partial section shows a diagram of the front axle. The side of the hull and the bilge connections of the bottom in the bow reinforced sheet pads 6. These pads are inserted the transverse beam 1 of a stainless steel pipe assembled together with the axles 15. Front pidlisky 12 (left and right) of your bushings are in the axle and are fixed by lock nuts 18 so that they can freely rotate therein. Sleeve, in its Central part, is pushed on the splines of the lever of the shock absorber 5. 1 — beam, 2 — rack steering gear, 3 — gear presenter, 4 — pull steering, 5 — arm shock absorber, 6 — pad zygomatic, 7 and 11 traverses the parallelogram, 8 — fork wheel 9 — wheel 10 — wheel fork pin, 12 — case 13 pendants-pull ball, 14 — hull boat, 15 — pin, 16 — oil seal 17 — Ganka, 18 — locknut. The outer part of the suspension is assembled together with the sleeve, has a box shape, which are mounted in a parallelogram of rotation of the wheel. Cross member 7 on the splines put on the 10 pin plug In front wheel 9. Cross member 11, freely rotating on the finger, rods connected to the crosshead 7. The upper elongated crosshead lever 11 articulated with ball rod 13, which, in turn, through the rod 4 is connected with the rail 2 of the steering equipment. The internal cavity of the suspension are filled with oil or grease, and the ends of the sleeves are sealed by seals 16. In the plug 8 are attached to the wheels of the scooter “Tula 200”. The lever 5 connects with the lower head hydroporinae motorcycle shock absorber (not shown in the diagram). The upper head of the shock absorber is hinged to the slider installed on a special deck beam. Suspension, front and rear wheels have no locking of constipation, as installed with a negative angle, and can be withdrawn from the stowed position only by force. Moving along the beam, the upper head of the shock absorber lift up the lever 5 and tilt the suspension at 110°. While the front wheels are raised above the waterline and the boat traffic on the water do not interfere. Steering amphibians set as all cars on the left side. It consists of a housing seated directly on the transverse beam 1; Reiki 2, which is connected with the gear 3, is integral with the planets-coy; bevel gear pressed on the shaft the helm, and steering wheel. The steering mechanism provides a steering angle by 30° to both sides. REAR AXLE. 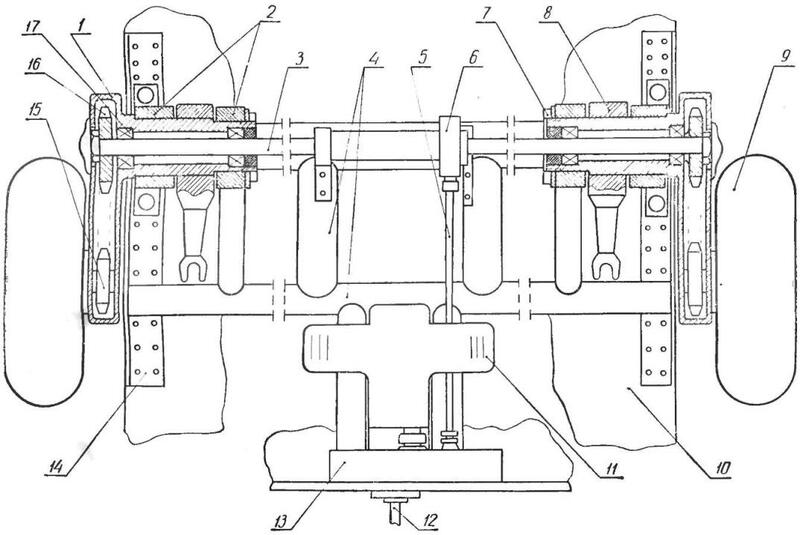 Figure 2 shows a diagram of the rear axle. For additional zygomatic plates 14, riveted to the hull, installed the sub frame 4, welded stainless steel pipes. The front transverse beam of the frame is integral with the axle 2. Similarly, the rear suspension 1 front made in the form of rotating axles in the hollow of the lever. Through the Central hole suspension bushings 1 driveshaft 3 passes, sitting in the two support bearings 17. At one end of the axle shaft pressed on sprocket 16, the second end includes a splined connection to the differential 6. In the box suspension parts goes a motorcycle chain, which transmits rotation via a driven sprocket 15 of the rear wheel 9. 1 — body suspension, 2 — axle, 3 — axis, 4 — under engine frame, 5 — shaft PTO, 6 — differential, 7 — nut, 8 — lever of the shock absorber, 9 — wheel, 10 — hull 11 — engine “M-72”, 12 — shaft propeller wines that, 13 — gear, 14 — zygomatic plate, 15 — sprocket driven, 16 — asterisk leading, 17 — bearing support. The right and left rear axle shaft on the splines is connected to the differential, so they have independent rotation. Fastening of levers of the shock absorber 8 in the rear mountings similar to those described above. Rear wheels as the front, climb up by moving the slider upper head of the shock absorber on the beam that is installed along the strong outline of the body. All four of the slide damper is connected in a common hydraulic system with the appropriate cylinders, so the wheels rise above the water at the same time. Without leaving the car, the driver can raise the wheels and to continue the movement in the water. Conversely, before you exit the water you can omit the wheel and including rear axle, the move to go to a beach. The ENGINE is located on the underframe 4. 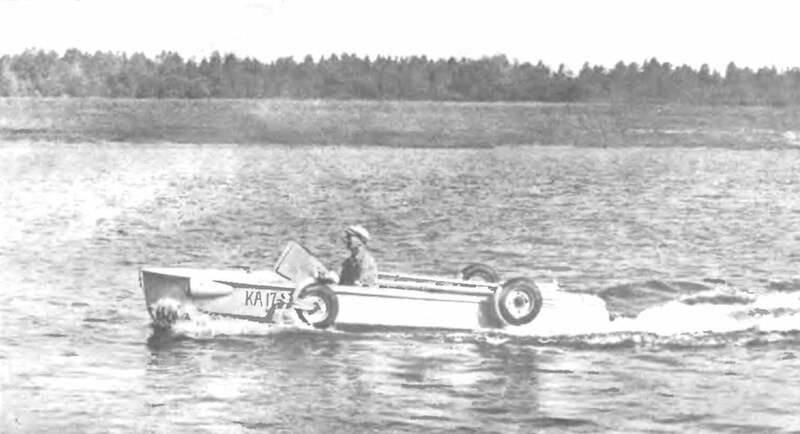 Behind him, on the transom installed the gear 13 of his own design, which has three output shaft: rear axle, propeller and winch (not shown in the diagram). The inclusion of universal joints independent. They can work simultaneously and separately, which is especially useful when you exit the water with a winch. Engine “M-72” air cooling, so before cylinders are equipped with a special fan with a five-bladed impeller mounted directly on the continuation of the bearing journal of the crankshaft. This ensures constant operation of the fan when the motor even in the Parking lot. The impeller is closed in a homemade casing separating the air flow on both cylinders. The MECHANISM of the PROPELLER made on a flip bracket together with the feather of a water wheel. Control of the boat on the water by turning the double handle, installed the driver under the steering wheel on the steering column. System of ropes moves the rack mounted on the transom and connected pinion steering folding bracket. The bracket with the propeller freely swung to the lower position without any fixation. Before you screw the strong clip keeps it from breaking. The propeller from the outboard motor “Moscow-25”. Driven by cardan gear and can switch on forward and reverse stroke. Gear shift allows to set the desired speed of the boat. In the bow of the boat bottom-mounted shield with pedals brake, clutch and gas. Crank to the left of the driver on Board. Here, at hand, — the gear lever (right), handle reverse reverse, the hand brake lever. Dashboard features speedometer and toggle switches enable the light alarm, ignition and headlights. WINCH. For self-recovery winch the boat out of the water in it has a special winch of his own design, worm pair, the drum and wound on it with Ø 5 mm. cable winch Drive is provided from a motor through a cardan gear. One end of the rope attached to the drum, and the second launched in the nose part out. At the end of the rope there was a hook. In the case where you cannot use wheels to get to shore, the cable end with the hook to pull ashore and catch him for any object (a Bush, a post, a tree or a plugged number). Then include both the winch and the rear wheels. Samovyrazheniya can be applied on impassable roads during walks. The boat “Kazanka”, building an outdoor. Seating capacity — 4 pers. The idea of creating a boat on wheels itself is not new. There are many variants, but the amphibious vehicle N. M. Purtova, in our opinion, is quite perfect design and deserves a lot of attention. The designer himself expressed the opinion that the respective companies could start production of the complete units and parts that boat owners can remodel their “Kazanka” and “Progress”, well, it is impossible not to agree.